I remember playing X-Wing in Wave 4 and being super excited that my favorite ship was coming out. That's right, the TIE Defender, the best Expanded Universe fighter ever designed. Expensive, sure, but better than anything the Rebellion or Empire ever fielded up to that point. It came with some nasty tricks for its time (White K-Turn!) and a mean stat line. Also at that time came out the OTHER Expanded Universe TIE project that was the best and most expensive that it could be. It was from an inferior game, and did stupid cloaking things. The TIE Phantom. 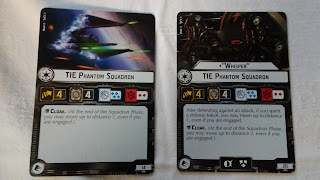 And as much as I wanted to make my beautiful TIE Defenders work, it was clear they were outclassed by the TIE Phantom's movement shenanigans. These guys are going to be annoying aren't they? Sure enough. The TIE Phantom is a 4 speed, 4 hull, 4 Blue Anti-Squadron, and 2 Fickle Red Anti-Ship (non-Bomber). The gimmick it comes with is Cloak, which lets the ship move at the very end of squadron phase, even if engaged, a full distance 1. Not awful, good for positioning advantage. It doesn't hit like a Mack Truck (though it does hit hard) and it is still very killable. But it can jump around a bit, and that is good for the fluff. Like a little mini-Rogue, it can set itself up for the next turn very effectively. Okay, done having X-Wing flashbacks as PS9 Whisper pre-Cloak Errata jumped around eating my 3 Amigos X-Wings like they were candy. 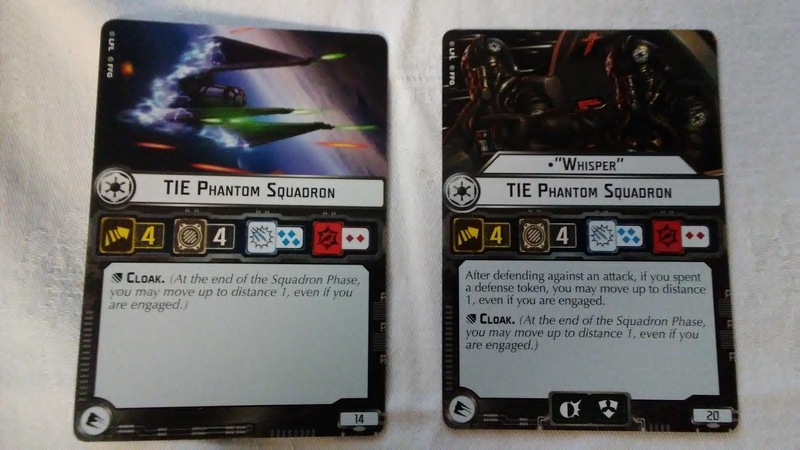 Whisper only adds a Brace and Scatter to the TIE Phantom stat-line, and retains Cloak. His other special ability is going to make him very annoying to deal with though - "After defending against an attack, if you spent a defense token, you may move up to distance 1, even if you are engaged." Gonna be very difficult to pin down this 20 points of fun, without liberal use of Rogues or squadron commands. Or getting lucky with double accuracy results. At least he only has 4 hull and doesn't shoot 6 dice.